SURfaPLUS Internet Services provides online technical information on adjuvants, formulations and application technology. SURfaPLUS Internet Services publishes Adjuvants & Formulations since 2004. Visitors can download a free trial of Adjuvants & Formulations. 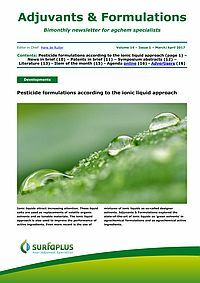 In addition to technical information regarding adjuvant chemistry, mode of action and performance, we publish in the Adjuvants & Formulations magazine and on the website ads of companies dealing with adjuvants and/or formulations. If you would like your company's information on the lists of adjuvant producers, adjuvant suppliers and / or formulators, please click here for additional information and the online advertising order form.